Interior Secretary Ryan Zinke speaks to members of the media outside the White House in Washington, Aug. 16, 2018. Interior Secretary Ryan Zinke’s claim that “environmental terrorist groups” created the conditions that enabled California’s wildfires triggered substantial blowback from environmental groups, who chastised the Trump administration official for downplaying the role of climate change in the blazes. 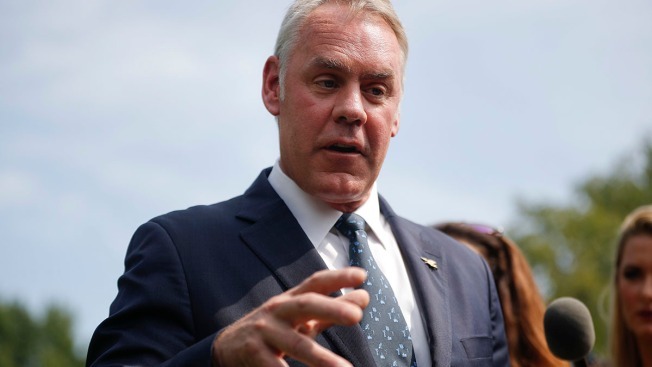 Zinke said in a radio interview with Breitbart News that environmental extremists were preventing the government from properly managing forests, leaving excessive fuel on the ground for the deadly blazes, NBC News reported. The statement is just the latest as the Trump administration moves aggressively to open more public land to natural resource extraction, including logging. Zinke later equivocated on his view, telling reporters on Thursday that “of course” climate change was among the reasons for the string of wildfires. But the Interior secretary’s precise position remained unclear, as he hours earlier had gone on Fox Business and cast doubt on the notion of humanity’s role in warming the planet.